Volatile constituents from waterlogged cypress wood were investigated by means of GC–MS to examine the alteration of terpenoids during anaerobic conditions. 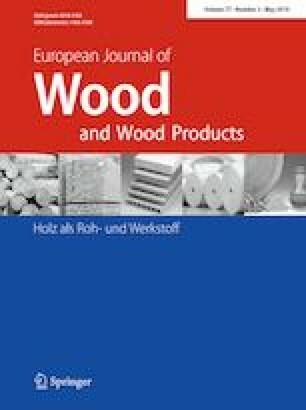 The results were evaluated by comparison with the terpenoid composition of recent cypress wood Cupressus sempervirens. The essential oils contained largely monoterpenoids (carvacrol, carvacrol methyl ether, p-cymene), sesquiterpenoids (α-cedrol, cedrene) and a diterpenoid (manool). The terpenoid characteristics strongly supported the relationship to the C. sempervirens wood. While sesquiterpenoids, i.e. α-cedrol, remained almost intact in archaeological wood, in particular monoterpenoids but also the diterpenoid underwent considerable alteration. The same compounds in archaeological- and extant woods allow the conclusion that the diagenetic transformations took place in monoterpenoid moiety in waterlogged wood. A novel degradation of carvacrol methyl ether and carvacrol was detected, and an alteration pathway was suggested in this study. Sesquiterpenoids were detected in higher amounts as unaltered forms in archaeological samples, and it was shown that these compounds were very resistant and stable. Moreover, because of a remarkable decrease in its amount, the diterpenoid manool experienced degradation or chemical changes in archeological samples. It can be concluded that alteration of Cupressus wood compounds probably occurred under waterlogged anaerobic conditions leading to reductive reactions, demethylation and dehydroxlylation of monoterpenoids forming monoterpene- and aromatic compounds. The volatile constituents of archeological wood can serve as valuable chemo-systematic markers for waterlogged archaeological softwoods adequately buried in an anaerobic environment. We would like to express our sincere thanks to İstanbul Archaeology Museum Director, Archaeologist Zeynep Sevim Kızıltan, for helping in the course of gathering of the wooden samples subject to research from Yenikapı excavation site.